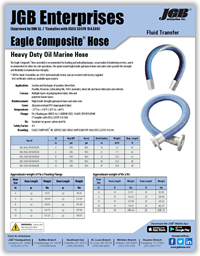 Eagle Composite® Hose (Approved by DNV GL / *Complies with USCG 33CFR 154.500) - JGB Private Brand - Hose by Vendor - JGB Enterprises, Inc.
- loading and unloading barges, ocean tankers and bunkering services, and other dockside operations. - handling suction and discharge of gasoline, diesel fuel, paraffin, kerosene, lubricating oils, 100% aromatics, black oils and heavy lubricants and solvents. * EAGLE Composite assemblies are tested at 1.5 times working pressure.